You are here: Home / A-Blog / Sarah Sanders Begins WH Briefing By Reminding #FakeNews Reporters Of POTUS Trump’s Many Accomplishments. 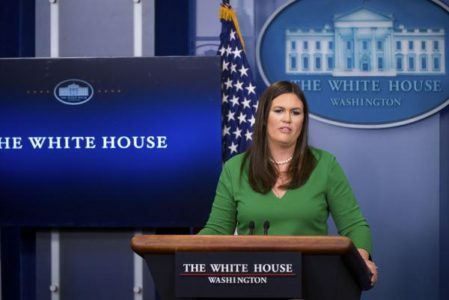 Sarah Sanders Begins WH Briefing By Reminding #FakeNews Reporters Of POTUS Trump’s Many Accomplishments. We’ve rolled back twenty-two regulations for every one new regulation, saving taxpayers over $8 billion and liberating America’s economy from the grip of bloated government. We’ve reshaped the American judiciary for generations. Justice Gorsuch was confirmed to the Supreme Court, and 22 judges have been confirmed, including a record-setting 12 circuit judges. We protected life by reinstating and expanding the Mexico City Policy that protects $9 billion in U.S.-taxpayer dollars from being used to fund abortions.